As another October comes to a close, many of us will find ourselves viewing the world through rose coloured lenses as National Breast Cancer Awareness Month brings an explosion of pink everything – from ribbons and bracelets to blenders and frying pans. And while we’ve all heard about the problems with greenwashing (explored in my earlier article Greenwashed), is it possible we’re being pinkwashed too? But really, what could possibly be the problem with a little pink? Well as it turns out, some pink-touting products may actually cause breast cancer. The site Ecouterre has put together a fascinating and horrifying list of 10 Ridiculous Pinkwashed Products That May Actually Cause Breast Cancer (2011). 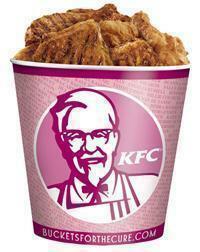 The list starts with KFC’s Buckets for the Cure. As if seeing fried chicken seep through a regular KFC bucket wasn’t disturbing enough, animal studies have shown an association between certain chemicals formed when meats are well-done, fried, or barbequed with the development of colorectal, pancreatic and yes…breast cancer. Ecouterre goes on to tell us that we’ve been pinkwashed by beauty products like lipsticks, nail polishes and rosy pink perfumes. And sure enough, as the Environmental Working Group’s Skin Deep database can attest, many of these products contain highly hazardous hormone disruptors, neurotoxins, and possible carcinogens. In another article, Ecouterre calls out Avon as one of the biggest pinkwashers. While running a highly successful and established 20 year ‘Breast Cancer Crusade,’ Avon is also a major supplier of many of these dangerous beauty products. 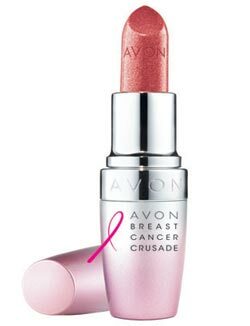 In fact, more than 250 of Avon’s products are categorized as ‘high concern‘ by the the Massachusetts Breast Cancer Coalition. To make things even worse, in 2005, “Avon shareholders voted 95% to 5% against a resolution to reformulate, in a reasonable time frame, all its products to be free of chemicals banned by the European Union for known or suspected associations with cancer, genetic mutations, or birth defects” (Zimmer 2012). So while Avon’s “Inspirational Life” lipstick may make women feel better about themselves it’s not going to do a damn thing for the health of their breasts. After making sure that your pink product isn’t going to cause breast cancer, there’s a whole host of other questions that the Think Before You Pink organization suggests you ask before you put your cash to the cause. For starters, the pink ribbon (and pink colour for that matter), isn’t regulated in any way so make sure the product specifically lists the organization that’s getting the cash. It’s also important to know how much is going to the cause – you might make a bigger difference if you donate directly. For more on pinkwashing check out Pastel Injustice: The Corporate Use of Pinkwashing for Profit in the Journal of Environmental Justice. Read more Urban Bandit articles on Toxins. Tags: Avon, cancer, carcinogens, greenwashing, KFC, pinkwashing, toxic, toxins. Bookmark the permalink. Previous post ← Get Outta My Bike Lane! Very good to highlight this situation…. I have been avoiding things like parabens for years but finally succumbed the other day to a pink lipgloss I had been eyeing up for a long time. Still, at least the product didn’t claim to be giving money to breast cancer research! It is hard to resist some things that’s for sure! And while I haven’t been too great on checking out products before I purchase – it is a good idea to check out what the Environmental Working Group says about the cosmetic you’re thinking about buying, or already wearing. I bet there’s also some type of app where bar codes could be scanned to bring up a direct link to the review – we’ll have to look into that!